First things first. Congratulations! Since you are reading this I assume you are expecting and therefore looking into your options of how to deliver. In this article, we will try to take you through the pros and cons of a natural childbirth and how to make a natural delivery a reality. In this day and age, a natural childbirth is not always the norm. In some countries around the world, it might even be hard to arrange a natural childbirth because their healthcare systems are set up for other practices. So first we will go through a few of the steps you can take to help yourself ensure your child comes into this world in a natural way. If you want a natural birth you are going to have to prepare and that takes both determination commitment. You have to be very clear about why you want to keep medication free; this will get rough and keeping that drive factor front and center in your mind will help you a lot when you are in the tough parts. In the midst of it all, it can be very hard to resist pain medication, but a clear set mind can get you through unmedicated. That being said, a birth never goes completely as planned and it is therefore good to keep an open mind about changes recommended by medical professionals. You are now committed to the idea of a natural birth and this is where you need to start. Going into labor and giving birth is a marathon event for your body and maybe even more demanding on the mind, so preparation is of the highest importance. As for the physical part of this journey, keeping your body moving helps you gather the strength needed. There are many good fitness programs that focus on preparing for delivering, but remember it is recommended to do slower paced exercises. Look into walking, swimming or yoga as these are relatively easy on the body while still working out your body and strengthening your pelvis. If you work a job that requires you to be sitting down many hours at the time, try to change up the way you work, since this not optimal for getting your baby in position. If you sit down too much, you will tighten up your pelvis. When your pelvis is tight, your baby can settle into your pelvis in a posterior position which can prolong labor and cause unnecessary pain. A posterior baby is not optimal and luckily there are things you can do yourself to make sure it does not happen. Most of these precautions are small exercises in line with stretching and prenatal yoga, but just getting up of your chair and walk around also helps. You can furthermore go ahead and do belly mapping or change out your recliner chair with a birth ball to sit on instead. Another part of your physical preparation will have to revolve around what you put in your body. When it comes to food to eat while pregnant it can be broken down into two equally important aspects; what you eat must be “real food” and that things you eat have the right nutritional value. Consult your doctor about suiting a diet for your specific needs. There are general rules though, eat plenty of quality protein (nuts, avocado, white fish), vegetables, and choose foods of different color groups (called “eating the rainbow”). Now for the mental preparation. For this element no shoe fits all, given people are different, the methods used for mental preparations are also very different. 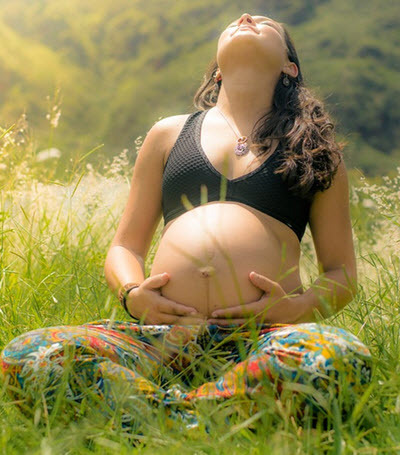 Moms have given positive recommendations for practicing mindfulness, meditation, prayer, and daily affirmation when trying to prepare for birth and connecting with their unborn. All of these suggestions are as good as the last one, try out a few things and feel what is right for you and your body. A doula is a nonmedical professionally trained birth attendant, who has gone through birth themselves. A doula will meet with you and advise you throughout the duration of your pregnancy, work as a coach through labor and help you afterward with basic care and breastfeeding tips. Having a doula is a major help through it all and studies have shown a bunch of benefits including, being more likely to have a spontaneous vaginal birth and less likely to have pain medication, epidurals, vacuum assisted birth, C-sections delivery, and post-delivery depression. Find a doula by consulting your doctor and get some references. Often it is all about gut feelings when choosing one, so interview a couple and choose the one you feel closest to. You will be happy in the long run to have someone whom you click with on a personal level. The last point we are going into is birthing classes. As with many other aspects of life, education is key. A class can help demystify the process and answer all the questions you and your partner might have. A good class should teach about preparation and equip you both with the necessary information to go through all the stages of labor. This will both ensure the safety of your baby, but also relieve a lot of stress for you as parents. When choosing a birthing class you should look for one outside your hospital. The birth classes hospitals offer are often angled towards being a good patient and not necessarily about giving you all the information needed to truly understand your options. I hope this article has helped clear up some of the steps you will need to take I you wish for a natural birth with no medicinal help. Now go do a ton of more research and take the steps you need to ensure the best possible pregnancy and delivery. And remember the most important thing is to listen to your body and taking it easy, good luck! Start saving for your child before it is born. That will allow you to give your children a good start in life when they move out. Compound interest guarantees that the money you save today will be worth a lot more in 18 years. Every USD you save now is likely to be worth at least USD5 when your child is 18. Always invest the money you save for your child in low to mid risk investments such as dividend stocks. Never invest the money in high-risk binary options or other high-risk financial instruments. A low-risk strategy is always best when you invest money long term.